For Immediate Release – October 25, 2017 – Oklahoma City, Okla. – The 2017 National Reining Horse Association (NRHA) Futurity & Adequan® North American Affiliate Championship Show is just around the corner. 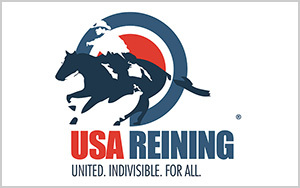 People from across the globe will come to Oklahoma City to get their fix on all things reining, including multiple horse sales. Sponsored by Markel Insurance, the Marketplace, Futurity Prospect, and Select Yearling Sales are premier sales taking place at the Futurity next month. 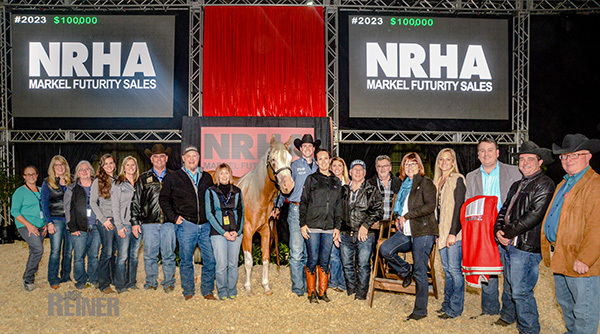 The NRHA Markel Insurance Marketplace Sale features an outstanding group of top producing broodmares with proven performance bloodlines in foal to the hottest sires in the reining industry. Also featured will be yearlings, 2-year-olds, and finished show horses. The event is set to begin at 10 a.m. on November 30 in Barn 3. Back for its 25th Anniversary is the NRHA Markel Insurance Futurity Prospect Sale. A sale preview will take place on November 30 at 3 p.m. in the Jim Norick Arena. This is your chance to get a sneak-peek of the industry’s most outstanding select 2-year-olds set to be sold in the Futurity Prospect Sale which is slated for December 1 in the Barn 3. 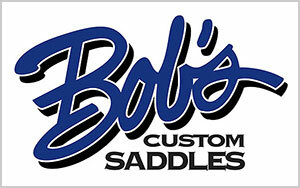 The sale will kick-off with a dinner at 5 p.m., which is open for anyone to attend. At 6 p.m., the event will begin with a special stallion auction, where all proceeds benefit the National Reining Horse Youth Association (NRHyA). Rounding out the 2017 Futurity Sales lineup is the NRHA Markel Insurance Select Yearling Sale, which begins at 9:30 a.m. on December 2 in Barn 3. Upwards of 80 of the industry’s highest quality select yearlings consigned by top breeders and trainers from around the world will be offered up for your consideration. 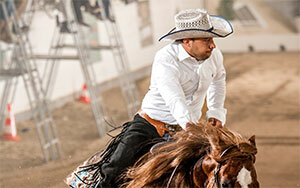 Pictures, videos, and catalog pages on all sale horses consigned can be seen on the NRHA website. Yearlings, two-year-olds, and show horses’ radiographs can be viewed in Barn 3 during the Futurity or accessed by a licensed veterinarian in the online Radiograph Repository. Interested buyers can complete buyer registration prior to the date of sale by visiting the NRHA Sales Office or by clicking here. Contact Tiffany Gonzales at sales@nrha.com with any questions. With three opportunities to view top-quality reining horses, everyone has a chance to attend a sale and find a horse to fit their needs! During the NRHA Futurity, the world’s best reining horses and competitors come to Oklahoma City to compete for an estimated total purse and cash prizes of more than $2 million. For more information on schedules, tickets, hotel accommodations, sponsors and more visit nrhafuturity.com. *The photo included is of the 2016 Futurity Prospect Sale High-Seller, Shine Dot Shine. For Immediate Release – October 19, 2017 – Oklahoma City – The National Reining Horse Association (NRHA) is proud to announce a new Four Million Dollar Sire—Gallo Del Cielo. With offspring earnings totaling more than $4,001,770.00, Gallo Del Cielo is only the 10th horse to reach this historic milestone. Gallo Del Cielo, commonly referred to as “Rooster,” was bred by Harold H. Stream III, of Lake Charles, Louisiana. Rooster stood at Polo Ranch in Marietta, Oklahoma where he lived nearly all of his life. The 1989 Bay stallion was by Peppy San Badger and out of Docs Starlight (by Doc Bar). 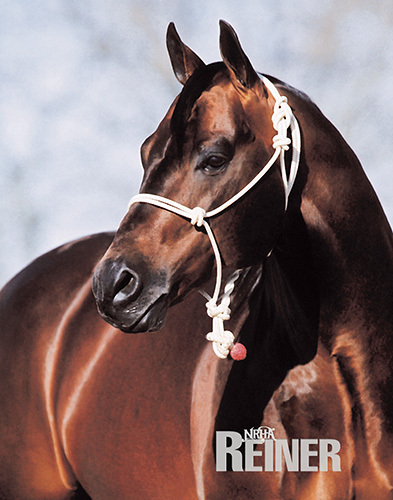 Rooster achieved NRHA Million Dollar Sire status in 2004. For more information on Farnam®, visit farnam.com. Sign up for Life with Horses, a free monthly e-newsletter, to receive the latest horse health news and product updates along with money-saving, subscriber-only rewards. Don’t miss your opportunity! Nominations close on November 1, so be sure to submit your form soon. On average, only about 6% of eligible members vote in NRHA elections. This means that 94% of members do not participate in the voting process! 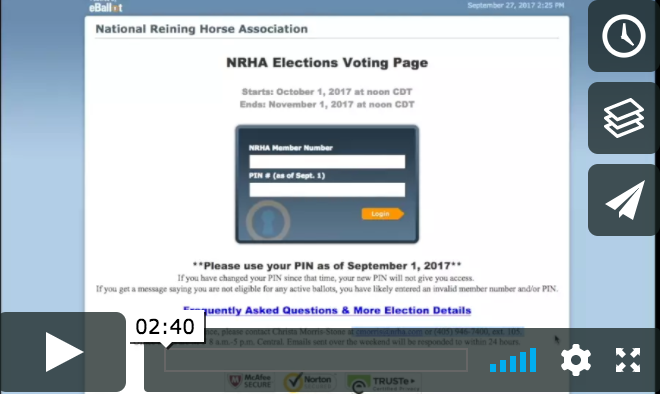 We encourage you to take advantage of this often-missed opportunity, cast your ballot to elect NRHA’s leaders, and make a decision for the future of your Association! Voting ends Novembr 1 at noon CDT, so log in now to participate! OR – Watch the video on the right to see how it works! 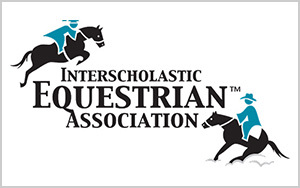 You can find more details online on the NRHA Elections page. Contact NRHA’s Christa Morris-Stone for assistance (cmorris@nrha.com or 405-946-7400, ext. 105). Emails sent during an election weekend will be responded to within 24 hours. NOTE: Voters must be individual NRHA members who are at least 19 years of age by January 1, 2017. Associate Members are not eligible to vote in this election, neither are joint, corporate or syndicate members. 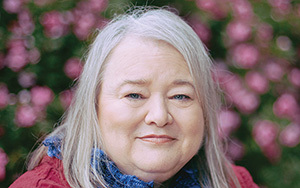 The Northeast election is for members in Maine, New Hampshire, Vermont, New York, Massachusetts, Rhode Island, Connecticut, New Jersey, Pennsylvania, Delaware, Maryland, and District of Columbia.